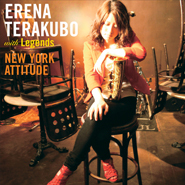 Erena Terakubo is barely 20 years old, and she has already accomplished what many musicians her age only dream of…Her debut album in North America on Four Quarters Entertainment, features accompaniment by the legends of Jazz, including Kenny Barron on Piano, Ron Carter on bass, Lee Pearson on Drums, and Dominic Farinacci on trumpet. Erena was born in Sapporo, Japan in 1992, and developed a love for the alto-saxophone, which she began learning at the age of 9. While still in her early teens she started attending workshops by famous visiting jazz musicians such as Herbie Hancock and Tiger Okoshi. When she was less than 16 years old, she attended a five week summer program at the prestigious Berklee College of Music, and her talent earned her a full scholarship to the institution, which she has been attending since 2009. At the same time, her talent and virtuosity was beginning to be noticed in Japan by the press as well as by Japan's jazz greats like Sadao Watanabe, Terumasa Hino, and American greats like Eddie Gomez, Anthony Jackson, etc. 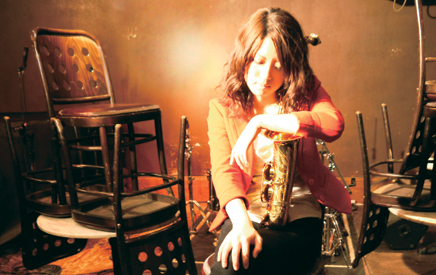 Erena soon signed a deal with Japan's major jazz label, King Records, and her first album, NIGHTBIRD, which featured Christian McBride and Kenny Barron among others, soon topped the top of Japanese Jazz starts, and a "star" was discovered. NEW YORK ATTITUDE is her sophomore album for King Records. We, at 4Q Records are pleased to release it as her debut album stateside to give jazz-lovers will have the opportunity to listen to and discover a new star, or should we say "a new bright light" from the Land of the Rising Sun…. From the very first note on the title song "New York Attitude" penned by one of the "Legends" on the album, Kenny Barron, to compositions by Erena's saxophone mentors Sadao Watanabe ('One For You") and Wayne Shorter ("Oriental Folksong"), to the evergreen standard "Body & Soul", or her own compositions, "That's The Truth" & "Fascination", it is very difficult not to be amazed by the maturity with which Erena approaches her instrument, whether it is the tonal quality, technique or her soulful interpretations. 2012 DC Jazz Festival, Kennedy Ctr.